New medical treatments and drugs go through rigorous testing before they are approved for general use. In the final stages of this approval process, suitable patients are invited to take part in Clinical trials of these treatments and drugs. Helen Rollason Cancer Charity supports Clinical trials to develop new cancer drugs and treatments at both Broomfield Hospital in Essex, and North Middlesex University Hospital in East London. Patients are able to access treatments which may be licensed but are not yet available on the NHS, are awaiting NICE approval or are a novel new agent. Since 2000, the charity has supported more than 3,000 cancer patients in Essex and London, resulting in effective new treatments that are now available to the general public. We support the largest Cancer Research Clinical Drug Trial Programme in the Essex Hospitals Network. 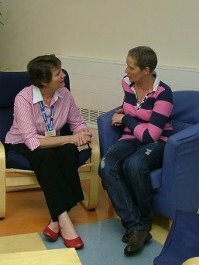 In 2011, the Helen Rollason Research Centre was opened at Broomfield Hospital to enable more patients to participate in trials for cancer as well as other conditions such as Asthma, Diabetes and more. During the coming year we expect to be supporting well over 200 people on such trials by making grants to the hospitals concerned. A clinical trial is a process to look at the most effective way of treating cancer. How are patients recruited onto a clinical trial? Am I eligible to participate in a research trial? The criteria for clinical trials vary but part of a research nurse’s role is to check the suitability of individuals for clinical trials. What can I expect when I take part in a clinical trial?